Background Myositis ossificans traumatica (MOT) involves the heterotopic development of lamellar bone after a traumatic injury. Despite being termed “myositis,” MOT is not limited to muscle but rather can involve tendons, fat, and fascia. “Traumatica” reflects that lesions are usually associated with a history of significant trauma, that is, fractures or surgery; however, many reports suggest they can also be linked to repetitive low-energy insults. In both cases, the inflammatory response secondary to tissue injury generates a proliferative osteoblastic cascade. Case Description We present a case of persistent wrist pain in a 43-year-old woman associated with yoga activities. Her radiographic studies demonstrated partial scapholunate (SL) ligament tear and an associated mass lesion. Surgical pathology revealed MOT involving the SL ligament. Literature Review MOT lesions in the upper extremity are usually localized around the elbow, and cases in the hand are relatively rare. There are no prior reports of occurrences within the wrist joint or in association with the SL ligament. However, biomechanical studies have quantified significant mechanical strains across the SL interval during various yoga poses. This pattern of microtrauma is capable of generating MOT. 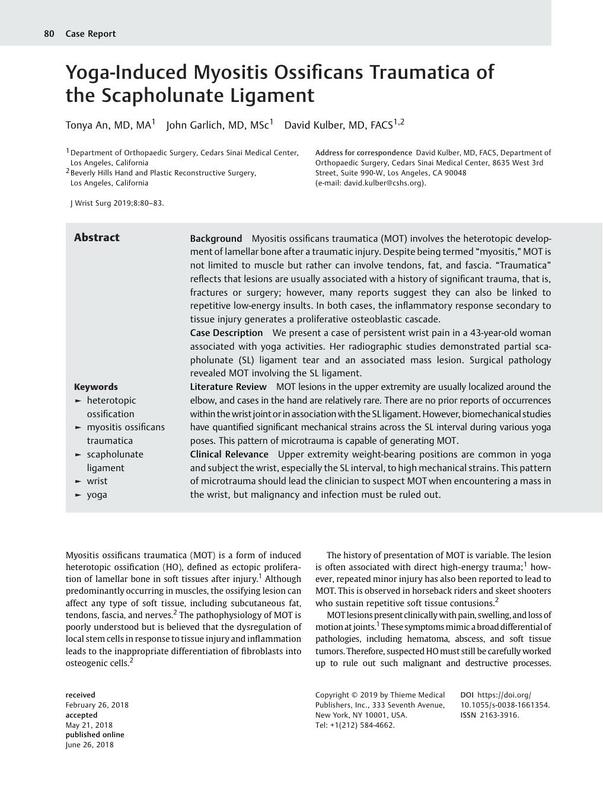 Clinical Relevance Upper extremity weight-bearing positions are common in yoga and subject the wrist, especially the SL interval, to high mechanical strains. This pattern of microtrauma should lead the clinician to suspect MOT when encountering a mass in the wrist, but malignancy and infection must be ruled out.